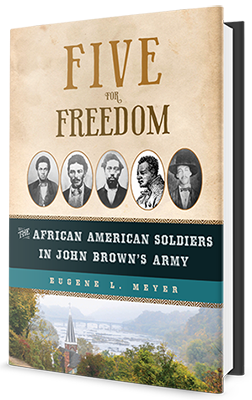 Eugene L. Meyer is the author of the new book Five for Freedom: The African American Soldiers in John Brown's Army. 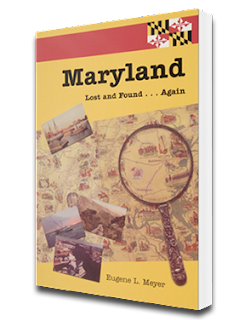 He also has written Chesapeake Country and Maryland Lost and Found...Again. 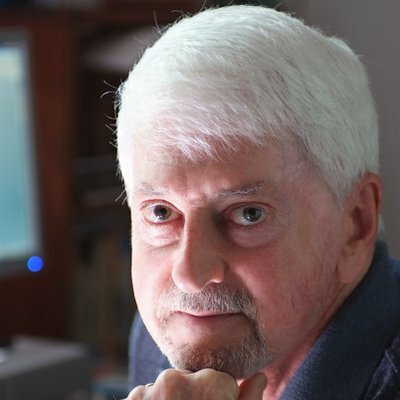 A former Washington Post reporter and editor, he is the editor of the B'nai B'rith Magazine and a contributing editor for Bethesda magazine. He lives in Silver Spring, Maryland. Q: You note that you first learned about the five African Americans who participated in John Brown's raid while working on an article for The Washington Post in 2000. At what point did you decide to write this book? A: I became aware of the five men when covering a cemetery plaque dedicated to one of them – Osborne Perry Anderson – over Veterans Day that year. Anderson was the sole survivor of the raid and wrote the only insider account. When I left The Washington Post in January 2004, I wrote a much longer article about him for the Post Magazine. I learned that he was close to Mary Ann Shadd Cary – both were from Chester County, Pa. -- and had followed her to Canada after passage of the Fugitive Slave Act in 1850. There, as the first black female editor and publisher in North America, she produced the Provincial Freeman, and he worked for her as a printer and sometime writer. 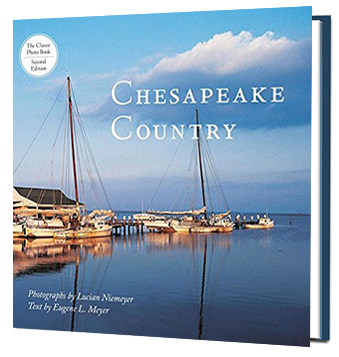 She would later help him write his book, A Voice from Harper’s Ferry. During the war, they were both recruiters for the U.S. Colored Troops, and afterwards, he followed her to Washington, D.C., where she raised money for his healthcare and then for his funeral when he died in 1872. I speculated there was more to their relationship and in 2007 looked at her papers at Howard University. I found nothing about him. But I did find letters she had published in the Provincial Freeman from John Anthony Copeland, another African American raider, to his family on the day of his execution. They were heart-wrenching. It was then I realized there was a larger story here, perhaps even a book, but it had to be about all five men. Thus, was born the idea of Five for Freedom. The idea languished for a few years until I signed on with an agent. I had been working on a memoir, which he liked but wasn’t able to sell. I then turned back to Five for Freedom, and we signed a contract in March 2016, with a July 2017 deadline. A: I had something of a head start with my earlier research on Anderson, but there was still much to learn in a short period of time on a subject to which many historians would devote years in the normal course of their research and writing—while also employing an army of researchers. But I’m a newspaper guy used to working on deadlines, so this was a welcome rather than a daunting challenge. Two of the raiders were from Oberlin, Ohio, so I spent some time there during August 2016, and, on the same trip, I drove up to Chatham, Ontario to learn what I could about that Afro-Canadian redoubt where Anderson had lived and worked before joining with Brown. I also spent time in Harpers Ferry and Charles Town, West Virginia, and in Winchester, Va., conducting both archival research and interviews. In addition, I traveled around Fauquier and Prince William counties, Va., to view locations that played a role in the pre-raid narrative. I traveled to tiny Cannonville, Utah to interview a descendant of Dangerfield Newby, who’d joined with Brown to free his enslaved wife and their children back in Brentsville, Virginia. One of the most important lessons from my research – which did not surprise me but buttressed what I had long known – was that our racial history, though usually seen in stark black and white terms, was so much more complicated and nuanced. It still is today. Four of the five men were of racially mixed background, and all were free men of color when they joined with Brown. The fifth, Shields Green, claimed to be a direct descendant of African royalty and was known as Emperor. He had escaped from a Charlestown, S.C. plantation and was generally regarded as not biracial. That is why I insisted on calling them African Americans, avoiding the racially polarizing and inaccurate labels of black and white. I was surprised to learn about the great debate that occurred in the Virginia General Assembly in January 1832 over slavery. Following the Nat Turner rebellion, the previous August, some 2,000 Virginians presented 40 petitions to the legislature. They ranged from status quo to graduated emancipation to outright abolition. Thomas Jefferson Randolph, the third president’s grandson, argued the middle ground. Ultimately, the lawmakers couldn’t agree on anything, and less than three decades later, after the John Brown raid, the nation was engulfed in the Civil War, a bloodbath that resulted in some 750,000 deaths but, alas, also failed to resolve the underlying issues, with which we continue to grapple today. Q: In the book's epilogue, you focus on Ashton Robinson III, a descendant of Dangerfield Newby. Why did you choose to end the book with his story? In truth, it was never that. It was and remains that we, as a nation, have never overcome our original sin of slavery, and, until we do, we will never achieve the aspirational goal of, as New Orleans Mayor Mitch Landrieu has put it, out of many we are one. Five for Freedom is very much an American story. It belongs to all of us, and Ashton embodies it. Q: What do you see as the five men's legacies today? A: They died to make us free, but the struggle continues. A: I am looking into the historical intersection of race and gender in the fight for women’s suffrage. My memoir also remains a work in progress. Zelig-like, it seems, I lived and reported half a century of recent history, from the antiwar movement of the 1960s on, from inner city streets to Wounded Knee, from Chesapeake to Appalachia, starting as the kid-in-residence at the old New York Herald Tribune Washington Bureau during the 89th Congress, watching LBJ sign the 1964 Civil Rights Act, interviewing the Beatles and Thurgood Marshall, covering the Iran hostage release, and working for The Washington Post during Watergate. But, also as a reporter of conscience trying not to cross the line into advocacy, letting my work speak for itself. I also address from a personal perspective the challenges of writing about race for a major metropolitan newspaper and my time as a newspaper union activist at a pivotal moment for the industry in the pre-internet era. A: Five for Freedom is not only about how these men came together at a fateful time and place, October 1859 in Harpers Ferry. It’s been a privilege and an honor to be able to tell the stories of these largely forgotten men, overshadowed for 160 years by their martyred commander. They were truly “hidden figures” who came to Brown for different reasons and by different routes. Hopefully, they are hidden figures no more.